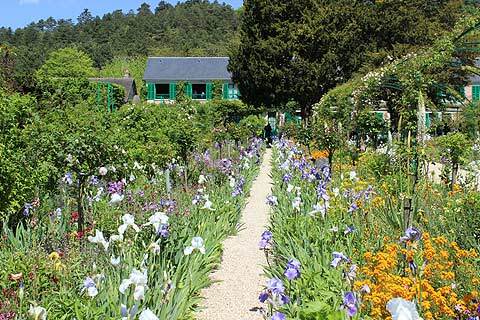 Claude Monet's house and garden is in the village of Giverny to the north west of Paris. 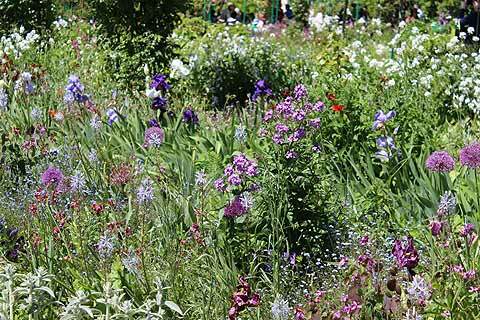 Claude Monet's garden at Giverny is probably the most famous garden in France. 500 000 people visit every year. Monet painted some of his most famous paintings whilst living at Giverny. These included as his water lily and Japanese bridge paintings. Monet lived in Giverny from 1883 until his death in 1926. 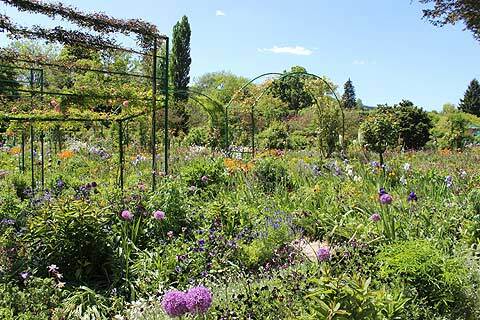 The garden itself is in two parts with a flower garden in front of the house and the more famous water gardens were started ten years after Monet's arrival at Giverny and constructed on land bought on the other side of the road from his house. Interestingly locals were originally opposed to his plans to build water gardens, fearful that the strange plants would poison the water of the tributary feeding the ponds. 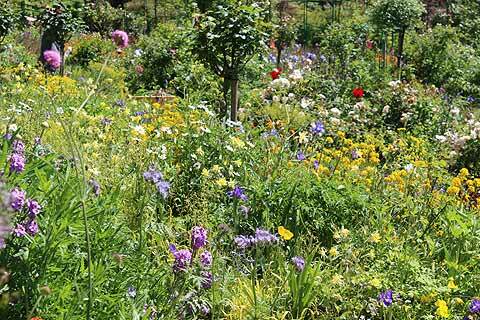 The flower gardens cover about a hectare and are laid out in colour themed, borders. There are literally thousands of flowers in these gardens including masses of tulips, irises, oriental poppies and peonies - plants with wonderful colours providing an inspiration to Monet's paintings. The water gardens have a Japanese theme and there is a replica of the Japanese bridge which featured in Monet's famous paintings. As well as visiting the gardens you can visit Monet's lovely, and very colourful house. It is fairly simple in style but filled with warmth, colour and paintings. The water garden may be the most famous part of Monet's garden and will be particularly interesting to fans of Monet's wonderful water lily paintings but for me it was the flower borders in front of the house that completely bowled me over. This garden is quite simply stunning. Be sure not to miss a visit if you are nearby. I visited in late spring. Having mostly seen photos of the garden taken in early spring with the fabulous blaze of colour provided by tulips, daffodils, pansies and cherry blossom amongst others I was worried that the gardens may be a bit bare immediately after the tulip season. Hower the gardens were absolutely bursting with colour and completely gorgeous. 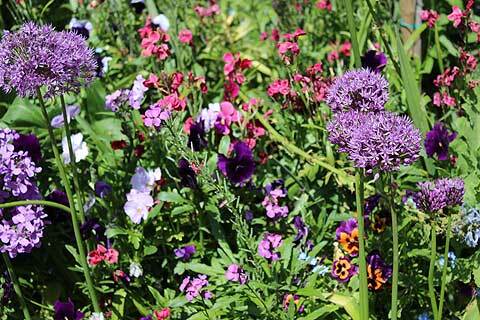 Many of my favourite plants were in blloom - alliums, peonies, irisis, wallflowers and some early roses. These were in the blue borders and there were also large yellow borders also bursting with colour. Summer planting includes roses, clematis, rudbekias, salvias and sunflowers and as autumn approaches dahlias take centre stage with asters and rudbekias and a carpet of nasturtians in the 'Grand Alléé - the central alley. The planting was colourful but obviously selected with a painters eye and every step of the huge walled garden is a visual treat. Obviously Monet was pleased with it too as it features in some of his paintings such as this one at the Musée d'Orsay in Paris. The garden is laid out in straight lines with lots of long beds with walkways between them and then some large areas of grass and trees. The voluptuousness of the planting disguised the simplicity of the garden design. Careful management of the gardens allowing visitors to walk up some alleys but not others meant that despite the huge numbers of people visiting it was always possible to see much of the garden without people blocking views and making taking photographs impossible. I now can't wait to visit the gardens in all of its seasons! 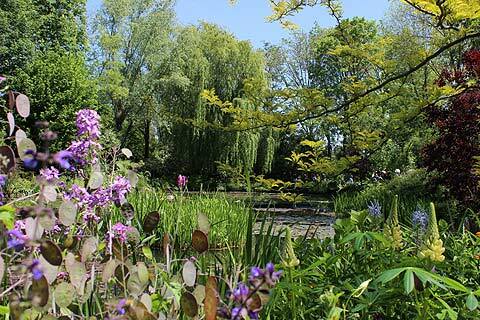 After ten years of living in Giverny, Monet bought some land from his neighbours and dug a small pond. Apparently neighbours objected as they were worried his 'strange plants' would poison the water. Undeterred Monet continued expanding his ponds until we have the large ponds we can visit today. Monet was inspired for this garden by Japanese gardens and a collection of Japanes prints that can be seen in his house. The ponds are filled with his famous water lilies and of course you can see and walk on the bridge which features in his famous water lily paintings. 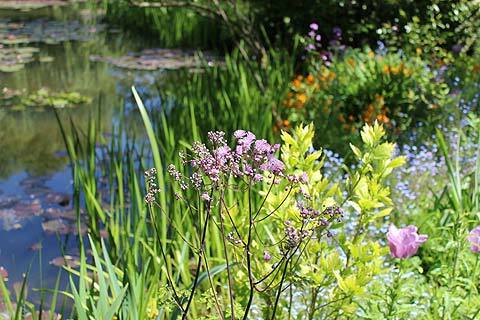 The edges of the ponds are also beautifully planted with weeping willows, cherry trees, rhododendrums and azaleas, ferns, irises and much much more. To see the water lilies in flower you need to visit in July or early August. The inside of Monet's house is simply furnished and colourfully painted and has a very warm and inviting atmosphere. You can see the beautiful collection of Japanese prints that inspired Monet's water garden and in his studio there is the Claude Monet foundation's giftshop. Monet's bedroom is charming, painted pale yellow with simple furniture and three large windows looking out on his beloved garden. The dining room is the most vibrant with walls and furniture all painted a rich canary yellow - apparently Monet did not care for the dark wood so fashionable in Victorian times! 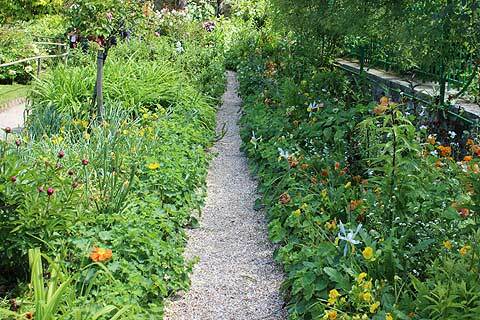 Monet's garden is situated near Paris in the village of Giverny. The nearest town is Vernon. The garden is open every day from 1 April to 1 November. 09.00-18.00. Last admissions at 17.30. Tickets cost 9.50 euros for adults and 5 euros for over 7 year olds. To visit the museums buy a combined ticket. There are often large queues and so booking on line or buying tickets from the tourist office of Vernon is highly recommended to avoid the queues. In the village of Giverny is the Musée des Impressionnismes giving a visual history of Impressionism. The museum has some very nice gardens. 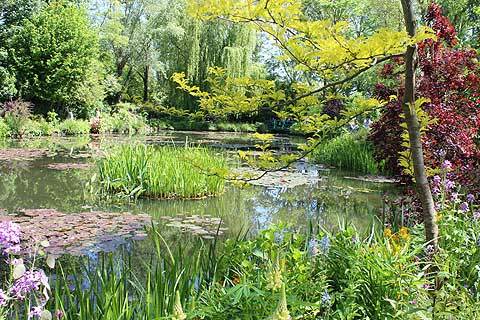 In nearby Vernon the Musée A G Poulain contains the only Monet original in the Giverny area. Many more can be seen at the Musee Marmottan Monet in Paris.